Rain alarm is an application which detects the rain water and blows alarm. They are useful devices and play an important role in various industries such as automobile, irrigation, and wireless communication. Desiging a rain alarm system is quite simple and we have designed here a demo rain alarm project with the help of 555 Timer IC. The main component of this rain alarm is rain sensor, I have purchased one, but we can also build it at home. It’s very easy to create a rain sensor. Take a sheet of Bakelite or mica, and paste the aluminium wire on it according to the diagram shown below. The Gap between the wires should be around 3-5mm. You can see that whenever the rain drop would fall on rain sensor, it will short the point A and B and a voltage would get applied on the base of Transistor, and it will become ON. We can also use copper wire for rain sensor but copper generally reacts to oxygen to form oxide, so it needs to be cleaned on regular basis. 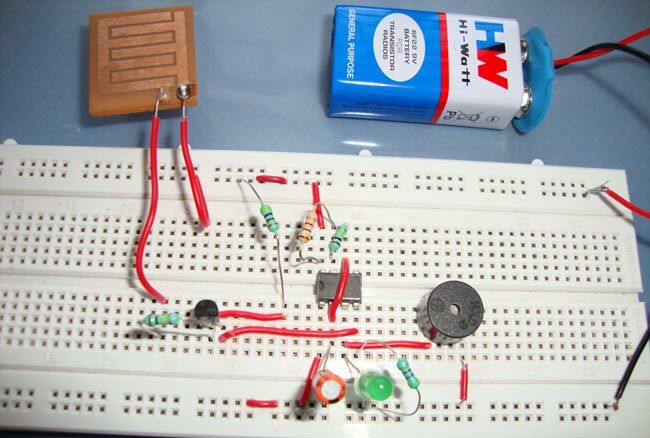 It is a very simple rain alarm circuit which is designed using mainly a transistor, water sensor and a 555 timer IC. Whenever there is a rain, rain drops falls on the rain sensor, and as you can see in the diagram of rain sensor, water on rain sensor would short the Point A and B. As soon as Point A and B become short, a positive voltage would get applied on the base of Transistor Q1, through the resistance R4. Because of the voltage at the base, transistor becomes ON (initially it was in OFF state), and current started flowing form collector to emitter. Now Reset PIN 4 of the 555 Timer, gets a positive voltage and 555 timer IC becomes ON and Buzzer starts beeping. Here we should note that initially there was no positive voltage at Reset PIN 4 of 555 IC, as it was connected to the ground through resistance R5 (4.7k) and 555 IC only works when Reset pin gets positive voltage. Here we can see that 555 Timer IC has been configured in Astable mode so that Buzzer generate a oscillating sound (means periodically on and off). This oscillation frequency can be controlled by changing the value of resistor R2 and/or capacitor C1. Pin 5 control Pin, should be connected to ground through a .01uf capacitor. Resistor R3 and R4 has been used to control the transistor’s collector and base current respectively. Rain sensor should be kept at 30-40 degree from the ground, so that water cannot stay on it, for the long time, this will prevent the alarm to going on for a long time. What kind of motor do you want to connect? Simple DC motor can be connected to the output of the 555 using a NPN transistor as a Amplifier. Tell me the drawbacks of making this project using ic55. i am asking this because some has made this project using arduino and some has made project without using ic555. And tell me which way is used to check drawbacks in your circuit project. Can you tell me the substitute method of making this project. what are the cautions if we want to implement it in house using main supply rather than using 9v battery. All projects on the Website are properly tested and working. Hello sir we are working on this project.we did the connections same as per your circuit diagram but we are getting buzzer sound without rain drop and sensor .can we know the drawback ?? Check the circuit connections again, I think you must have connected the Point A and B. Connect rain sensor between A and B, then post your results. Plz check the connection of the transistor. And do check the data sheet of the transistor. Thr is a mistake in the conection that goes to probe or sensor. Dont go for the breadboard connection... Connect as it is in the circuit diagram. Tq. Where can I find a good rain sensor? Can someone please send me a link? It easily available on eBay and amazon or you can buy it from local electronic shop. You can connect it using a transistor and capacitor, connect it with some musical IC(UM66) otherwise it will produce weird sounds. Use Search box above to search Speaker related circuits. The opposite effect is happening with my circuit. The buzzer remains on without any water detection, and once water is detected it turns off. Please let me know what the issue is and how I can fix it!! Which transistor are you using? Also check your circuit again. hello, i implement the circuit on ISIS software as recommended above and i put a led instead of buzzer in order to see the result but the led flashed in both cases when A- B is open and when it is closed so what the problem please? Your breadboard shows an LED, which I would like to employ. Can you please tell me the connections, if possible. Connect the LED in parallel with Buzzer with a resistor of 220 ohm. You mentioned that it needs a 220 ohm resistor to connect with the led but I dont see one in your video which is a successful circuit . And I am also curious that is it possible to implement a diode into this circuit ? LED in not in circuit, I mentioned if someone wants to connect then he can connect like suggested. Why and where do you want to connect Diode? How do you make pin 4 active low ? Hello. Can you help me if i want to add mcp3008 to the circuit to read analog on raspberry pi? my buzzer turns on without any water detection can you help me please. i am using a differnt kind of buzzer aswell. can i replace the buzzer with any other instrument so that i can turn on or off circuit supply to external connected device? Hii we wnant to do some advance in this rain project.we are thinking that we are gonna to make automatic cloth placer.when rain comes the clothes of that place are collect at dry place.is that possible?plzz replay i think u understand what I mean.